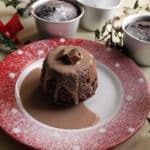 Slow Cooker Chocolate Caramel Puddings are the perfect midwinter treat, and these little puddings have a secret, a special treat inside that makes them even more delicious. Inside each of the little Chocolate Caramel Puddings there is a piece of caramel filled chocolate bar, or you can use chocolate caramel sweets. As the puddings cook the chocolate and caramel melt inside, what a decadent treat! You could steam the puddings in a saucepan with a saucer in the bottom or, if you have a steamer then use that, but the Slow Cooker works really well as it gently bubbles away and you can go away and leave it to do its thing without worrying about the pan boiling dry. The Chocolate Caramel Cream couldn’t be simpler to make, just melt the chocolate caramels in the cream, and it is ideal to serve with the Chocolate Caramel Puddings. 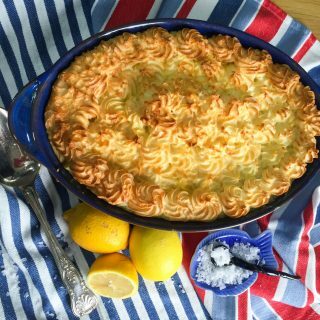 If you feel that is a little too much then you could also serve with plain pouring cream, ice cream or custard. 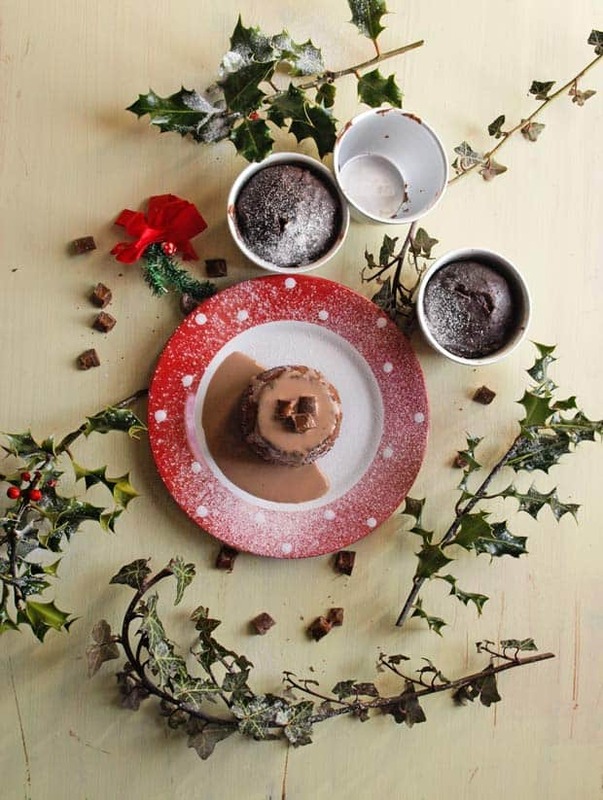 Little chocolate steamed puddings with pieces of caramel filled chocolate inside. Butter 3 x 6 oz mini pudding basins and put a circle of baking parchment in the bases of the basins. Add the chocolate into the centre and fill the rest evenly between the basins. Cover with baking parchment and foil and tie with string. Boil a kettle and pour the boiling water into the slow cooker pot and add the puddings, the water should come about half way up the pudding basins. Put the lid on the slow cooker and cook on high for 1 1/2 hours until the pudding has risen and the centre looks firm. The puddings should slide out of their basins, but it they don't then ease round them with a blunt knife or small spatula. Place the cream and chocolate caramel into a small pan and warm slowly until the sweets have melted into the cream, serve warm over the puddings..
You can make the puddings in advance and reheat in the microwave for 30 seconds before serving. Double up the quantities to make enough for six or make a big pudding and steam for 2 - 2 1/2 hours. Many thanks to Lucy for hosting the November Slow Cooked Challenge. 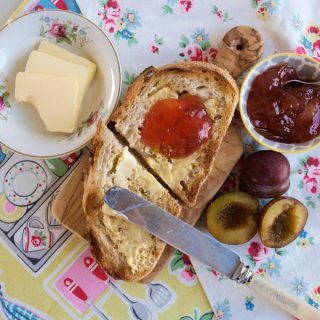 There are loads of fabulous recipes that I’m itching to make, why not pop over to the Slow Cooked Challenge Round Up and take a look. 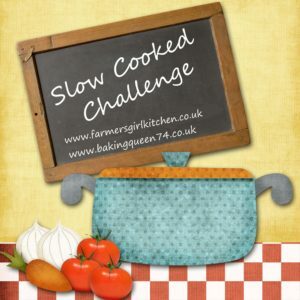 If you love Slowly Cooked food then why not join me and Lucy from Baking Queen 74 for the Slow Cooked Challenge – it’s not just about cooking in the Slow Cooker or Crockpot, any slowly cooked food can be entered. If you use twitter, tweet your post with @FarmersgirlCook @BakingQueen74 and use #SlowCookedChallenge and we will re-tweet it to our followers AND post your picture on the dedicated Pinterest Board. A round up of all the entries will be posted on the host’s blog. 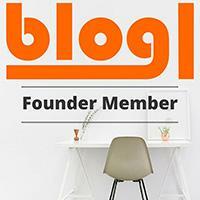 Recipes must be added to the linky by the 28th of each month and a round-up will be posted on the host blog. 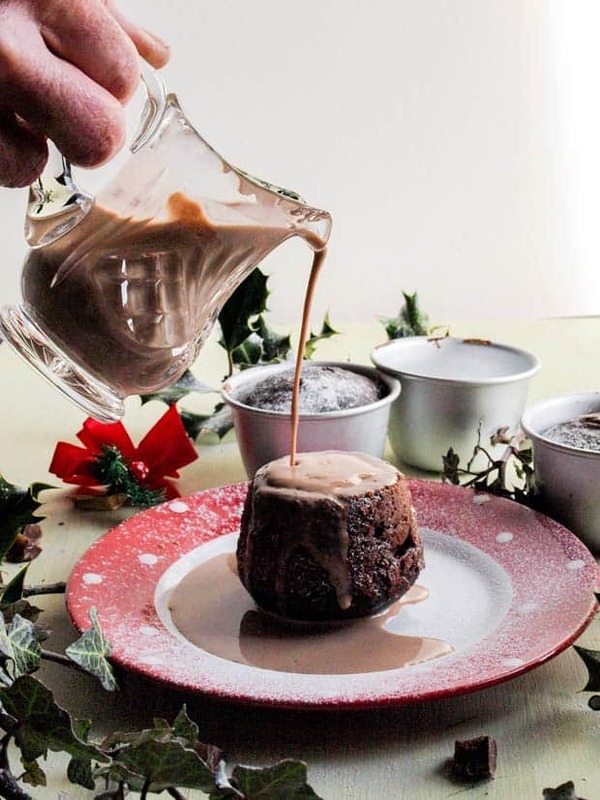 Mmm your chocolate puddings look wonderful Janice and I really love the festive food styling! Mini puds for each person are a great idea, my girls would love this. Thanks Lucy, it was fun styling the puds. They are very filling, I think I’ll look for smaller pudding basins! That looks wickedly good!. I’ve just got a new slow cooker after giving mine away a couple of years ago, so I’ll have to try some of your veggie friendly recipes. 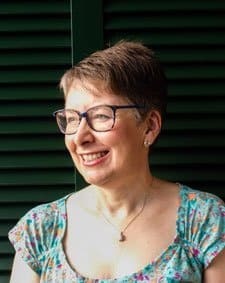 Glad you are back in the slow cooker world Jac. It’s such a great piece of kit when you have a busy life. Thanks Emma, I get a lot of inspiration online for the slow cooker, the slow cooked challenge really makes you use it! What a wonderful pudding! 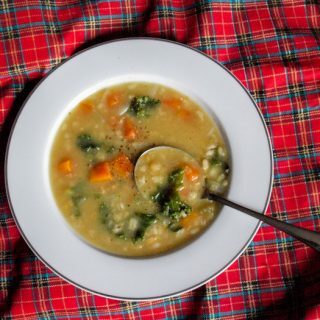 I love that it can be made in the slow cooker, I seem to be using it less and less since I got it so this may be something that I’ll make next 🙂 Thank you for sharing! Thanks Sylvia, I don’t know how I’d manage without my slow cooker. just looks so superb! I love it and will be making these for sure. Love the chocolatey sauce too! Wow, these look so good. I bet they are all the better for being slow cooked too. Gorgeous photos. 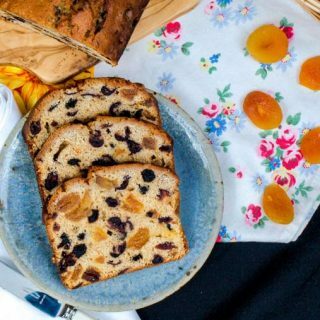 What a great recipe to make in the slow cooker. 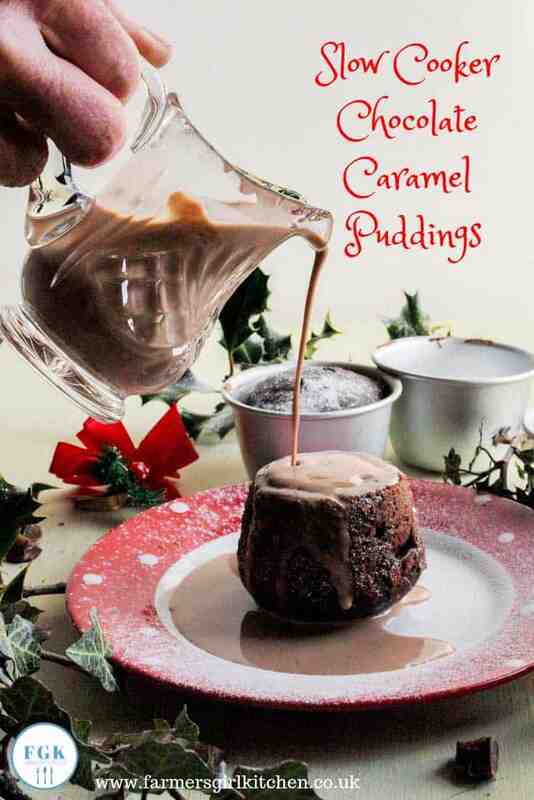 I need to use mine more often for puddings like this and this one has my family’s favourite flavours in – chocolate and caramel!